This wrestling singlet, affectionately titled “Sprinkles the Cat Wrestling Singlet” is a 100% sublimated wrestling singlet, made from a durable lycra / nylon combination. This lycra exercise wear, although traditionally used for wrestling can be unisex and used for a variety of sports where comfort and ease of movement is important. 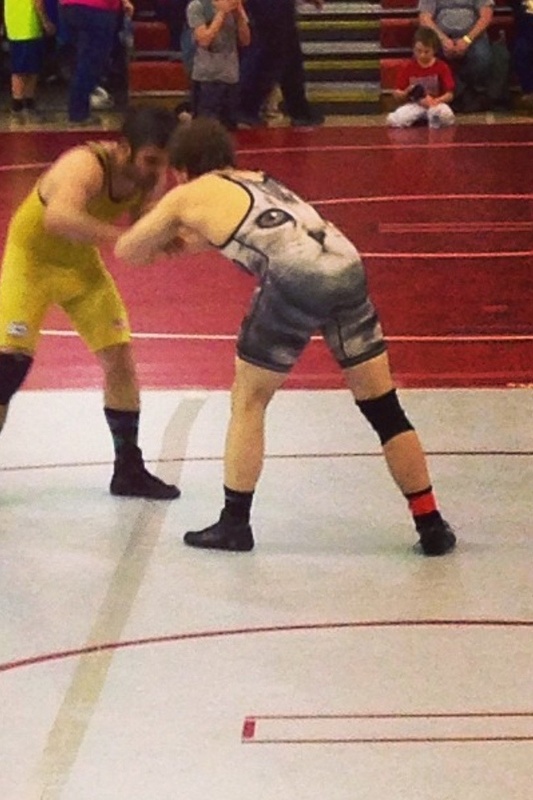 The wrestling singlet, retails for $74.95 from bluechip wrestling and is hand made in the USA. Found these unisex lycra suits from Fairy Love Boutique – guaranteed to impress those around you! Great for charity runs, dress-ups and different workouts. Our amazing lycra rainbow catsuits are so much fun and amazing to wear. They come in 5 base colours with flattering rainbow stripes. Will fit womens sizes 8-14. Great for ancy dress or festival costumes. Anytime’s a good time to get into lycra. Loving this porridge workout and Mr. Motivators colourful spandex unitard. A workout to support your love on all things lycra and Unitard. Thanks Expat Runner for this article. Check out the buns of steel! Custom made onesies in Lycra. Love this style. So many different options to match the top and bottom. Ask for men’s onesies! 1ZEE is active-wear to the power of three: it combines a crop-top, singlet and pants all in one. This catsuit-effect outfit is versatile and stays in place so that there are no wardrobe malfunctions when you use-it-to-move-it. That means the wearer doesn’t have to worry about tops riding up, pants riding down or underwear showing and can instead focus on the activity at hand. 1ZEE active-suits are made for gym workouts, weights, aerobics, pilates, yoga, rowing, running, dancing – just about any aerobic activity. Where do I buy male leotards? For those who seek the ultimate freedom of movement, the leotard and or the biketard is second to none. But where do you buy one and what should you look for? Both womens and mens nylon lycra and cotton lycra leotards can be bought online or at dance stores. There are many styles to choose from, including the biketard cut to the cheeky thong cut. Such as the photo above at Eleve Dancewear, and the gallery below. Personally I believe fit and comfort take priority. If you can’t go to the store, you need to make sure you will fit into it. Many suppliers will make you a custom lycra leotard or biketard, providing you are prepared to wait a few weeks and supply your measurements. Usually each designer will ask you to measure your bust, waist and then the girth (length between the groin to top of the shoulder). The ‘Annabelle’. Check out the mesh back, not only looks elegant but functional too! The ‘Adam’ biketard. Display your dynamic spirit with this dramatic biketard! The unique diamond pointed sides will make you stand out while the four color options allow you to express your creative side. Add a patterned lycra for even more impact! Another photo of the ‘Adam’. Eleve’s “Nadine” style leotard has a high neckline in front, with a lower scoop in the back. Color block it for a ultra modern look or design it with a playful patterned fabric. Choose up to four colors for a truly unique leotard that will have everyone asking where it came from. The reverse side of the Nadine. Note the open back and mesh to give extra breathability. Logan with 3 1/2″ side stripe. Would suit Yoga, running or Gym. His and Hers. Look fit and sporty together. Womens Leotard is the ‘Amy’ and is an ‘oh so slimming design’. The back of the Charlie. Great to show off your muscles in your back. The ‘Charlie’. Great two toned biketard. Reverse of the Geoff leotard. The “Marcus” with sleeves and Matthew shorts. A good option if you like different pants and shirts – why not mix and match. For vintage lycra male leotards they can be difficult to obtain, mainly due to the fact that they were around int he 1970’s and 1980’s, but there were more women’s leotards made. However with some shopping around on www.etsy.com or a quick search of www.ebay.com, you can pick up a good quality leotard which will keep your workouts interesting. The problem with male leotards is that they have such low demand for funky wayout colours that manufacturers only put out blacks, blues and browns. See below. When you compare the range and type of leotards for women, its a good thing that leotards can be unisex and can be worn by men, women and children. There is a slight difference between male and female leotards, being the additional fabric in the front pouch area. However, if you are wearing lycra shorts or gym shorts over them, no one is none the wiser. Yumiko womens leotard review. This purple womens leotard is well made and the blogger reports some great made fabric. It was “expensive” but “well made”. Thanks to the Koolchicken for this post.